We are excited to announce a new era for everyone connected to UK Elite Soccer, Inc.
Steel Sports acquired UK Elite Soccer in 2013. Since that date, we have enjoyed a supportive and productive relationship with our parent organization. Steel Sports is a social impact business with a mission to form a new standard in youth sports participation. 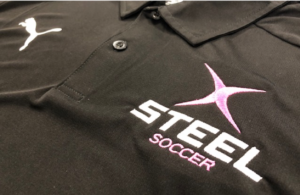 Spring 2019, UK Elite Soccer will commence an extensive brand transition, adopting the name Steel Soccer. A new identity will act as a catalyst for positive change, filtering throughout the youth sports community. A robust and dedicated coaching company will surround all of our staff, clients, players, and partners. The existing management and coach structure will remain in place. Over the coming months you’ll see it’s not just our logo that is changing. We will be upgrading our website and social media messaging along with our focus to better communicate with every individual family. We will also be launching a proprietary Steel Sports Coaching system that will set the bar for coaching standards. Craig McGinn – Executive Director at Steel Soccer, commented. Mick Smoothey – CEO of Steel Soccer added. We’re incredibly proud of the work that we do at UK Elite / Steel Soccer and thankful for the players, families and relationships that surround our organization. Please follow our journey on social media and let us know what you think about our new brand identity. Headquartered in Hermosa Beach, CA, Steel Sports is a social impact business with the mission of inspiring youth to reach their potential, on and off the field, by developing them as athletes and people through the Steel Sports coaching system. Through its “kids first” approach, Steel Sports is establishing the Steel standard in youth sports and coaching, forging the next generation of leaders by instilling Steel Sports’ core values: Teamwork, Respect, Integrity and Commitment. Steel Sports creates a positive youth sports experience for over 100,000 athletes each year. In addition to Steel Soccer, Steel Sports operates Steel Baseball at Baseball Heaven and the National Youth Baseball Championship.